Hermes enables you to evaluate a given set of Java (bytecode) projects to comprehend their basic properties and to select those projects that have interesting, distinguishing factors when evaluating and testing your static analysis. For example, when you want to test that your analysis is able to handle all types of bytecode instructions, then you should take a close look at the results of the respective query (BytecodeInstructions) which reports the usage of Java bytecode instructions for a given project. Additionally, Hermes can automatically select projects for you such that at all instructions are guaranteed to be in the final corpus and that the overall code base of the selected projects is minimal w.r.t. the overall number of methods. This minimal corpus can be computed once all queries are evaluated. To start the computation go to File → Compute Projects for Corpus. Hermes can be run in headless mode to just evaluate a set of projects and get back a CSV file with all results or you can start the UI which enables more advanced exploration of projects. A query is basically a mapping between some feature and those elements of a project that implement/provide/have the respective feature. For example, a feature could be the kind of type (interface, class, enum, annotation) which is defined by a specific class file. The query would then analyze all class files of the project and assign each class file to its respective category. In the context of Hermes, we would consider the query as simultaneously deriving multiple features. All queries in Hermes have to inherit from org.opalj.hermes.FeatureQuery and have to implement the two methods: featureIDs and apply as seen in the example blow. Next, we will discuss a complete query which finds native methods. // recommended to use short, but descriptive names. // Additionally, it is recommend to capitalize the name as used in titles. // the query itself (the `apply` function below)! // we create a new empty LocationsContainer. // creating too many locations and filling up the memory. // Let's iterate over all class files belonging to the project. // if so, the reported (intermediate/partial) results will always be thrown away. // which may be shared, as soon as possible. if m.isNative // basically "the query"
// The current method is native and is added to the set of native methods..
// returned by `featureIDs` and the list of native methods. In some cases it might be interesting to also derive general project-wide statistic on the fly. In this case, the results should be stored in the project configuration's statistics object. E.g., if you would have computed the average size of the inheritance tree on the fly, you would then store the value in the project's statistics as shown below. Here, the string "⟨SizeOfInheritanceTree⟩" uses the mathematical notation "⟨⟩" to denote the average. The big advantage of registering all queries in the same place is that it is easily possible to order the queries. The recommended ordering is: descending execution time. This will reduce the overall runtime. 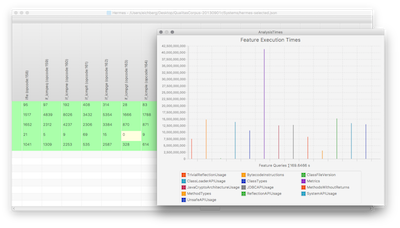 To get an idea of the execution time, just run Hermes and open the window Feature Execution Times. If you want to analyze your own library, just use the above file as a template for your project configuration.